Der Limbus[Club] ist ein Ort für Musik und Lyrik, an dem man es mit der Realität nicht zu genau nimmt. 1. 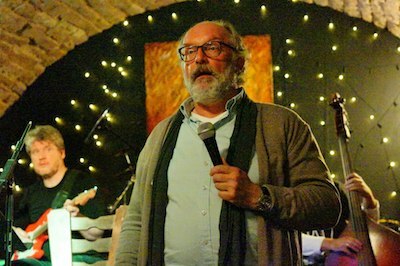 Sonntag im Monat um 20h (aktuelle Termine) im Jazzhaus Heidelberg, um zu einem jeweils gewählten Thema Musik und Texte darzubieten, zu improvisieren und neu zu interpretieren. In der Interaktion mit Lesungen inspirierender, satirischer oder provokanter Texte entstehen die musikalischen Arrangements spontan auf der Bühne: Jazz, Pop, Rock, Klassik, experimentell, fein oder brachial und ohne doppelten Boden. ...in English, please: What's all that about? The Limbus [Club] meets once a month (upcoming events) in the Jazzhaus in Heidelberg, Germany, and performs an eclectic mix of words and music based on a given theme. The themes are varied and change every month. The music is not rehearsed and arrangements are done in real time. This tightrope walking can lead to some very interesting and unexpected results. The two readers/wordsmiths, Heiner Grombein and Leif Schmitt, provide inspirational, satirical or provoking texts, interacting with the music pieces. The musicians are all professionals involved in various band, solo, recording, composing, theatre and teaching projects, but this is their once a month chance to let their musical hair down, with a no-holes-barred approach and with no prisoners taken. Not for easy listening fans. They are collecting a small but dedicated cult following.